(A) Non-credited aborted mission (4:45 flight time) High oil pressure. Considered personal error. For target dates and targets see Combat Missions. (P) See Nose Art Photos. 1Lt Andy R. Virag (P)(POW) - 32 dispatched (31 credited) missions flown: First mission Pilot with combat orientation CoPilot 2Lt John W. Parker; 1 missions as a Lead Crew CoPilot (260); 1 mission as a combat orientation CoPilot with another crews (271). All other missions as First Pilot. POW on 11/21/44 (Mission 275). 2Lt Edward R. Beck (CP)(POW) - 28 dispatched (27 credited) missions flown: 26 credited missions with 1Lt Virag (All Virag missions except 225, 237, 255, 260, 271); With 2Lt John R. Lutz (248). POW on 11/21/44 (Mission 275). 2Lt Hertzel Harrison (N)(WIA) - 9 credited missions flown: 8 with 1Lt Virag (225, 226, 227, 229, 230, 231, 233, 237); 1 with 2Lt Edmund W. Gaines (248). Last mission on 28 Sept 1944 (Mission 248) on which he was wounded from flak shrapnel in his face and legs and removed from combat status. The 1Lt Virag crew used substitute Navigators after mission 237 - 2Lt James R. Durkin, from the 1Lt Truman K. Eldridge Crew on 8 credited missions (238, 245(A), 246, 248, 250, 251, 255, 256, 259). Other Navigators used on other missions. 2Lt John C. Rhyne, Jr. (B)(KIA) 7 credited missions flown all with 1Lt Virag (225, 226, 227, 228, 229, 230, 230. Killed on mission 231, 24 August 1944, when hit by flak shrapnel. Body returned to Molesworth. The 1Lt Virag crew used substitute Bombardiers and Toggliers after mission 231. S/Sgt James E. Jeter, Jr. (E)(POW/WIA), S/Sgt Cyril A. Vrabel (R)(POW), S/Sgt Stanley Gurka, Jr. (BTG)(POW) - 30 dispatched (29 (Credited) missions flown - all with 1Lt Virag. All POWs on 11/21/44 (Mission 275). S/Sgt Jeter lost part of his leg on mission 275. Was shot twice more by German civilians on the ground but survived. Sgt Raymond L. Schalk (WG) - 5 credited missions flown - All with 1Lt Virag (225, 226, 227, 228, 229). Removed from combat status following mission 229 on 15 August 1944. Crew size reduced from 10 to 9 men following mission 229 when one of the Waist Gunner positions was deleted from the 1Lt Virag crew. A substitute Waist Gunners used following mission 231 on 24 August 1944 after both original crew Waist Gunners were removed from the crew. Sgt William J. Casperson (WG) - 2 credited missions flown (230, 231) - All with 1Lt Virag. Removed from combat status following mission 231 on 24 August 1944. Sgt John H. Bowman (TG)(POW/WIA) - 31 dispatched (30 credited) missions flown: 29 credited missions with 1Lt Virag (All Virag missions except 261 and 271); With 2Lt Cecil J. Gates (272). POW on 11 November 1944 (Mission 275) - Was wounded with flak shrapnel in his head. 2Lt Harold Scheer (N)(POW) - 10 credited missions flown: 6 with 1Lt Virag (264, 265, 266, 269, 274, 275); 4 with other Pilots (150, 267, 268, 272). POW on 21 November 1944 (Mission 275). S/Sgt Bert Cottrell, Jr. (BTG/TOG)(POW) - 28 dispatched missions flown: 3 with 1Lt Virag as Togglier (263, 274, 275); 26 with other Pilots - 16 as BTG with original crew Lt Charles B, Mainwaring (213, 214, 215, 216, 217, 220, 221, 222, 224, 227, 228, 229, 234, 246, 250, 256), 9 with other Pilots - As BTG (258, 268, 269, 270, 272), As Togglier (259, 262, 265, 266). POW on 21 November 1944 (Mission 275). Sgt Jack R. Allerton (WG/BTG,TG)(POW) - 18 credited missions flown: 15 with 1Lt Virag as Waist Gunner (251, 252, 254, 255, 256, 259, 261, 262, 263, 264, 265, 266, 269, 274, 275); 3 with other Pilots (246 - BTG), 250 - TG and 272 - WG). POW on 21 November 1944 (Mission 275). 2Lt James A. Durkin (N) - From Truman K. Eldridge Crew - 9 dispatched (8 credited) missions with 1Lt Virag (238, 245(A), 246, 248, 250, 251, 255, 256, 259). Completed 35 mission combat tour on 1 November 1944 (Mission 265). 1Lt Donald W. Torley (B) - From Allen W. Langford Crew - 9 dispatched (8 credited) missions with 1Lt Virag (235, 237, 238, 245 (A), 246, 248, 250, 252, 254. Completed 35 mission combat tour on 9 Oct 1944 (Mission 254). 21 November 1944 (Mission 275 to Merseburg, Germany in B-17G 44-6600 (No name) (359BS) BN-B. The 1Lt Virag Crew took over the second (high) flight of the lead Squadron after the mission had been aborted by 2Lt Sidney L. Underdown. During the bomb run the right wing of B-17 44-6600 was hit by flak and the right aileron was knocked off by B-17G 44-6309 Duchess' Granddaughter (359BS) BN-T piloted by Lt James F. Green. Bombs were salvoed, except for one that couldn't be released. About 10 minutes later, after loosing altitude and having difficulty maintaining control, the 1Lt Virag B-17 was hit by German ME-109s. 1Lt Virag then ordered his crew to bail out. All parachute jumps were made safely and the entire crew became POWs. The B-17 crashed near Sangerthausen, Germany (Missing Aircrew Report 11198). 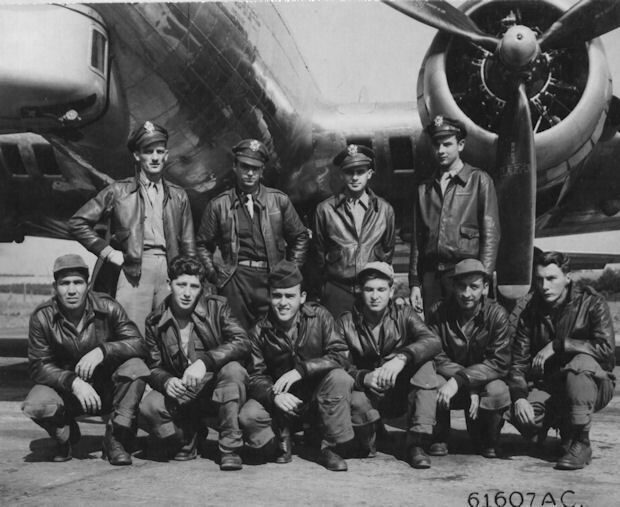 The six original Virag crewmen on mission 275 (Virag, Beck, Jeter, Vrabel, Gurka and Bowman) found Mersberg to be their nemesis when flying on the final mission of their combat tour.